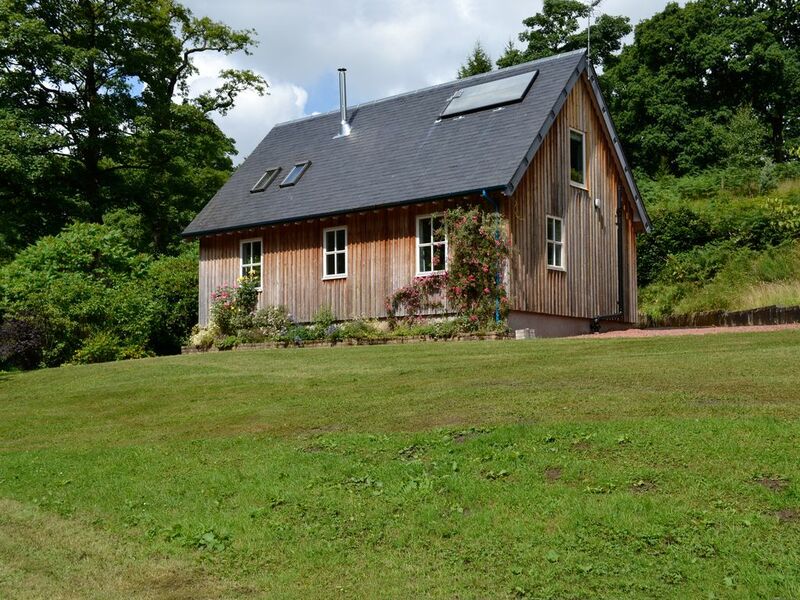 Overlooking Campsie Fells, cosy lodge with woodburner, in secluded woodland setting, Loch Lomond and the Trossachs easily reached. Nestling within this secluded woodland setting, these detached holiday lodges overlook the Campsie Fells, and are a great base for exploring all that central Scotland has to offer. Loch Lomond and the Trossachs National Park is 20 miles away with walking, cycling, fishing, golfing, horse riding and watersports on offer, while also being only 20 minutes from the cosmopolitan city of Glasgow with galleries, museums, historical attractions, superb nightlife and fantastic shopping. Stirling and Edinburgh are easily accessible by car. Shop and pub 2½ miles, restaurant 3 miles. Kitchen area: With electric cooker, microwave, fridge, freezer, dishwasher, washing machine and tiled floor. Bathroom: With bath, wet room area and toilet (wheelchair access). Electric central heating included. Unfenced garden with seating area. Wheelchair access. Both properties: Electricity, bed linen, towels and Wi-Fi included. Initial logs for wood burner included. Cot available on request. Highchair. Natural woodland grounds. 2 pets welcome, to be kept on a lead at all times (working farm). Bike store. Private parking for 2 cars. No smoking. Please note: There is a stream in the grounds. ADDITIONAL INFORMATION - The twin beds are zip and link. Wifi is available, however, this facility cannot be guaranteed to be available at all times due to the unpredictability of Service Providers. There is a river/stream close to the property.